As most of you know, everyone involved with NRP is very anti-DRM. We feel that it is an insult to our readers because all DRM says is that a publisher or an author doesn’t trust the reader. We also feel that you, the reader, should be able to read the e-book you just purchased on any e-reader you own. Finally, we feel that adding DRM to an e-book is like waving a red flag in front of a bull. It simply eggs on folks to try to break it and then, once they have, to offer it for free to others who haven’t paid for the book. So, do we like piracy? No. If we find out that a site is offering our titles without permission, we will go after them. After all, we’re here to make money for our authors. However, we also know that a little bit of piracy is inevitable and, frankly, it is promotion. The vast majority of people who read e-books are honest. If they read an unauthorized version of one of our titles, they’ll go out and find the legitimate title and buy it or they’ll buy more titles by that author. So it’s a win situation for us and for our authors. What is worse, in my opinion, is what happened over on fanfiction.net recently (and this isn’t the first time something like this has happened, nor will it be the last). Basically, Cynthia Eden was notified by a number of fans that her book, Deadly Heat, had shown up on the site in the guise of fanfic. Oh the names had been changed — to Edward and Bella — but that was basically all. The so-called author of this piece of Twilight fanfic also changed the POV from third to first AND — and this is where I can understand Ms. Eden getting a bit hot under the collar — acknowledged that the names of Edward and Bella belong to Meyer and the Twilight franchise but that she meant not copyright infringement. Note that she said nothing about the book she plagiarized. You can read more about this on Ms. Eden’s blog and this post on PW.com. Plagiarism is the bane — and greatest fear — of most authors. We work long and hard to write a novel. It’s so much more than just sitting down at the computer and writing. In a lot of ways, it’s like giving birth. To then find that someone has taken it, filed off a few of the identifiers and claimed it as their own is enough to send us screaming into the night. It doesn’t matter that this was posted on a fanfic site. You’d be surprised how many people — people who buy books — read these sites. Can you imagine how they’d react if they paid for the novel that had been plagiarized — after they’d read the so-called piece of fanfic? All it takes is one reader saying in the right forum that author A stole a plot from a fanfic site and claimed it as her own. The damage is done because someone else is bound to pick up the thread and spread it. Even thought the author is the one who had her plot ripped off by the fanfic poster, it is the author who will have to defend her work against the cries of plagiarism. After all, how many times do we compare the date of fanfic post to the publication date of a book or short story? According to Ms. Eden, the fanfic poster has taken down the plagiarized piece, noting that it was an “experiment”. Sorry, I buy that explanation no more than Ms. Eden appears to. I’d like to give the fanfic poster the benefit of the doubt, but the fact that she made the disclaimer about Twilight and yet remained silent about the true basis of the work speaks volumes. At least to me. Don’t get me wrong. I have nothing against fanfic. I’ve been known to write it, as have a number of authors. It is a wonderful way to hone our craft and have fun doing it. But the key here is that you have to “write” it. That means coming up with the idea, the plot, following canon — or having a darned good reason for breaking it — and putting your own spin onto it. It’s not just changing the names and POV of someone else’s work. Whether the plagiarized work is offered for sale or simply put up for free on fanfic sites, it is still plagiarism. Worse, it’s stealing. The poster has stolen another person’s hard work and is stealing their credit. Instead of taking the time to go through and file off the literary serial numbers, spend that time and effort to write your own story. It’s a lot more fun. 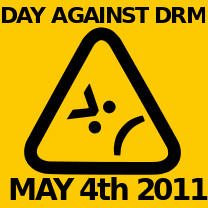 Today is the third annual International Day Against DRM. This is one “cause” everyone at NRP can get behind. When you buy an e-book, you should be able to read it on any device you own and it shouldn’t be tethered to one type of device or another. Nor should there be a limit to the number of devices you can download it to. We’ve all suffered that fatal hard drive crash and find we can’t read an e-book we bought because the new hard drive has a different version of Adobe DE on it, etc. So, if you agree with those supporting the call for no more DRM, let the publishers still demanding it know. Email them your concerns and vote with your pocket book because, let’s face it, money is all they will listen to. Now, the irony of this is that two of the so-called Big 6 publishers who not only add DRM to their ebooks but also have adopted the Agency Model of pricing have announced their first quarter earnings for this year. Guess what, digital sales for them are up. Hatchett UK’s digital sales were more than four times what they had been and now comprise approximately 5% of their total sales. That said, it is still important to note that the company’s overall publishing sales were down 10% — something they attribute to the fact there are no more Twilight books. Which also shows a potentially fatal weakness. No company the size of Hatchett should rely on a single franchise of novels to make a profit. Simon & Schuster reported that digital sales comprised 18% of their worldwide sales the first quarter of this year. This helped lift profits, before debt and amortization, due to the decrease in shipping and return costs. How much more of an increase these companies would have seen if they didn’t load their books with DRM and didn’t price them higher than most e-book purchasers are willing to pay is anyone’s guess. Just as it’s anyone’s guess if they will actually read the writing on the wall and realize that e-books aren’t the poor second cousin anymore but are, in fact, a viable and vibrant part of their product line. As I said earlier, if you support doing away with DRM, want the freedom to be able to buy an e-book at competitive prices and be able to read it on any device, let the publishers know. Send them feedback and vote with your pocketbooks. And pass the word to your friends to support International Day Against DRM. Well, it’s Sunday morning and I’m find myself in a quandary. I didn’t write the blog early yesterday because, well, I was hoping to find something that wasn’t related to Borders or publishers-doing-stupid-things. So, here I am on Sunday morning trying to get enough coffee into me to function and figure out what to blog about at the same time. Let’s start with the obligatory Borders report. Mark Evans has an interesting list of six reasons why Borders went bankrupt. While I don’t necessarily agree with what he has to say, he makes some interesting points. Author Melanie Benjamin talks about where she was and how it affected her when she first learned about the Borders filing. The bankruptcy trustee has named the unsecured creditors committee. Included on the committee are publishers and landlords. This article points out that one of the issues Borders will have to deal with is making sure it is closing the right number of stores AND the right stores under the circumstances. Also, this committee will have something to say about it. Add that to this article that seems to confirm my suspicions that there will be more closures in the very near future. Barnes & Noble released its third quarter figures for 2010. It doesn’t surprise me to see that their sales were pushed by digital downloads and tech. Barnes & Noble has done a lot of things wrong, in my opinion — most importantly having played a large role in driving out the independent booksellers. But they did two things very right, things Borders should have done. They embraced the internet and have had a strong online presence for years and they have a branded e-reader that is associated with their name. On the ongoing front of will we ever get an industry standard in e-book formats, Japan has made a step in that direction. It was announced last week that their publishers and electronics companies had adopted EPUB 3.0 as their standard. Unless I am completely wrong — very possible, of course — it isn’t going to be long before we see two main formats: EPUB and MOBI. The other formats will drop by the wayside. Whether we will see EPUB become the industry standard or if it remains split between the two will be something to be seen over the next 5 years or so. In other EPUB news, and this does fall under the heading of publishers-doing-stupid-things, comes this. Harper Collins once again proves, at least to me, that it doesn’t support e-books nor does it support public libraries. To start, there aren’t that many e-titles available for download from libraries. Now there will be even fewer. Why, because of this idiotic decision by HC. A decision that flies in the face of mainstream publishers’ very frequent cry that e-books aren’t real books. It is this argument that publishers use to justify DRM, saying that when we pay for an e-book we are only buying a license for it. But, with the decision to limit the number of times an e-book can be checked out, they are saying it should be treated as if it has the same lifespan as a “real” book. Can you say, have your cake and eat it too? Finally there’s this article about the increase in piracy of e-books, specific to this article Kindle e-books. I think what frustrates me the most about articles like this is the fact that it completely ignores the fact that piracy happens to ALL books, not just those released in digital format. How quickly they forget about how the last Harry Potter book hit the internet in PDF before it was released in stores. When’s the last time they brought up the brouhaha that surrounded Stephenie Myer when one of her manuscripts was leaked on the internet AND SHE THREW IT AWAY. But what really bothers me is how so many of the publishers who rant about e-piracy use the argument about how it is stealing from their authors and yet these same publishers do not give accurate accountings of e-book sales, nor do they give authors a reasonable royalty on e-book sales. Finally, on a personal note, I want to thank everyone who has supported Naked Reader Press and our authors. It dawned on me today that we put our first books up for sale just about 6 months ago. It’s been 6 months of hard work but it has been worth it. So thanks to everyone who made it possible. This is a question those of us involved with Naked Reader Press asked ourselves long before we opened our digital doors. We’d seen interviews with publishers who hold that a book is only the physical incarnation of an author’s work. Under this definition, those of us who buy e-books aren’t buying the book. Instead, we are buying only a license to read the author’s work in a certain digital format. DRM is their way of enforcing this by preventing us from doing with digital books what we can with physical ones — loan them, sell them, donate them. Even so, these same publishers who are so adamant about limiting our access to these e-books — and if you don’t believe me, buy an e-book using Adobe Digital Editions and try to read it on a machine that isn’t tied to that specific Adobe account — are more than willing to charge us as much or more for the digital version than we’d pay for the paperback copy of the book. Still, not all publishers feel this way. There are some like Baen Books who believe that, once you buy an e-book, it’s yours. They don’t apply DRM and don’t limit the number of e-readers or computers you can view the e-book on. This is the camp those folks behind NRP fall into. To them, and to me, a book is made up of the words an author writes. A book can take many forms — physical paper versions, electronic, audio, enhanced, etc. A book is something meant to be enjoyed by readers in whatever form they are most comfortable with. This divide in thinking may be narrowing. The Nook, and now the Kindle, allow lending of e-books (with publisher approval). Mind you, it’s limited to only being able to lend a book one time, for a period of two weeks. During that two week period, the original purchaser of the e-book cannot access it. There is the option being offered through these sellers for authors and small publishers to bring out their books DRM-free. Guess what, most of them — just like NRP — choose no DRM. Why? Because they are selling BOOKS, not licenses. So, what is a book? Here at NRP, a book is the collection of words, written by an author for readers to read on whatever computer or smart phone or e-reader they want. After all, why should it make a difference if the book is printed on paper or on your computer screen? A book is a book is a book and it’s time the industry’s definition caught up with technology. For those of you who aren’t familiar with certain American traditions, there’s a fairly new one that’s become part of the Thanksgiving holiday. Black Friday. The day when usually calm, kind and normal people turn into insane, often violent, shoppers with a sense of entitlement that’s big enough to try the patience of a saint. You may ask what Black Friday has to do with e-books. Normally, it would have little, if anything, to do with them. However, a trip to the kindle boards yesterday sent my blood boiling. (Okay, I’ll admit, it probably was boiling a little with fever yesterday anyway. Still, the insanity was enough to get to me.). Basically, what happened is that one of Amazon’s “lightning deals” — specials that are for a very limited number of an item at great prices — was an $89 K2. Unlike a number of other lightning deals, this one had gotten national coverage ahead of time. And, like all those folks who camped out at Best Buy and Target, waiting for the doors to open so they could run for the discounted [insert item here] and who were more than willing to get into fist fights and shouting matches, all those cyber-shoppers were lined up, watching the clock count down to the moment the K2s would be available. Yep, you guessed it. They sold out within minutes, maybe even seconds. And that’s when the howling started. There were claims of bait and switch, threats to never darken Amazon’s cyber-doors again unless they found a Kindle for this person or that. Never mind the disclaimer that it was a limited offer was in anything BUT fine print. These people wanted one. They DEMANDED one and screw anyone who didn’t agree. I don’t know what it is about certain topics that turns normally sane folks into whiny, demanding toddlers wanting that new toy NOW. But there is a lot of this same mentality when it comes to e-books. You see it when people complain about the prices of an e-book because, gee, it doesn’t cost as much because there are no printing or storage prices, nor shipping prices. You see it regarding piracy — and, as far as I’m concerned, that whining goes on on both sides of the issue. You see it from the publishers who won’t or can’t see that the market is changing and that they need to change with it in order to survive. The one group you don’t see it from, on a whole, is the one group who should be whining — the writers. Tomorrow, I’ll go into the actual steps required to produce an e-book. But today, let’s continue discussing this sense of entitlement that has permeated into the e-book market. Years ago, the music industry went through a period where they put DRM on everything, worried that the new digital age would mean the death knoll of the business. Yes, it did change the way music was purchased. Most is now purchased online. Gone are most of the music stores we used to go to and browse through the rows of CDs. There were a number of different formats as well, preventing the buyer from listening to their downloads on multiple gadgets. Piracy abounded. Did it kill the industry? Nope. The industry adapted. A standard format evolved and DRM did as well. Oh, sure, there are still certain companies that load the evil stuff into their music. But, on the whole, if you buy and download a song or album. you can play it on any MP3 player, no matter what the brand. It is up to the publishing industry to do the same. If I buy an e-book from Amazon, chances are it will be locked with DRM. There will be a limit on the number of authorized devices I can read it on. And, guys, it isn’t Amazon putting these limitations on. It’s the publishers. Why? Because they are worried about piracy. At least that’s what they say. In yesterday’s comments, Rowena noted that she can find her novels on certain pirate sites. Unfortunately, that’s just the way it is. There are those folks out there who take exception to DRM and will work to find the code to break it and then offer it to others out in cyberspace as a way to thumb their noses at the publishers. They don’t think about how this might affect an author’s sales. They aren’t even doing it to thumb their noses at the author — well, if the author is a best seller and has publicly come out against e-books….that’s a different story. There will always be someone out there who will post any e-book they can for free download. Same with music and video. They feel like they can do anything they want with it once they’ve bought it. Gee, there’s that sense of entitlement again. There’s another form of piracy – although, to be honest, it really isn’t piracy. At least not in my mind – that comes from DRM as well. But a bit of background, a number of publishers AND authors don’t look at e-books as “books”. They believe that you aren’t buying the “book” but a license to read the words. That’s why there is DRM. On the other hand, you have the buyers who have paid good money for the e-book and who believe they own it just as they would own a hard copy of the book. They don’t see this as merely a license or a “rental”. So they look for ways to break the DRM on the book so they can read it on different e-readers and make backup copies. Why, you may ask, is this important? Say you spend $9.99 for an e-book (which is going rate for a big publisher’s e-book from a best seller) this year. Next year, the e-reader you purchased it for dies and you buy a new one. If you purchased that e-book from certain sellers, you may not be able to download it again. Yes, there are download limits at a number of places. Of, you decided to go with a different brand of e-reader. That could mean the digital edition you purchased earlier won’t work with your new e-reader because of DRM. Your only solutions are to either buy a new digital copy or find a way around DRM. So, you have those who are good with programming coming up with scripts that let you extract the digital copy, free from DRM. Sense of entitlement? Sure. Justified? In my opinion, yes. The only group who is being hurt by both sides of this argument are the authors. They do lose some sales because their publishers either won’t release their backlist in digital format — leading folks to scan in their books and then post them online — or by overpricing their books in digital format. Again, this leads to piracy. Those who pirate the books also hurt the authors because they are taking money from the authors’ pockets. However, I would propose one more level here that most folks don’t take into consideration. Actually, I have to give Kate credit here. She reminded me that while a number of us might look for a pirated e-book for whatever reason, we do tend to make up for that lost sale later — either by purchasing that e-book when it finally becomes available through legitimate channels or buy purchasing other e-books (or dead tree books) from that author based on what we’ve read. So what’s the solution? The only one that will work long term is for the industry to accept the fact that e-books are here to stay. The more DRM that is attached to a book, the more programming folks will work to find and make available the scripts to break it. Either set up e-books as “rentals”, where you get to download and read them for a discounted price for a set period of time, or accept the fact that someone who “purchases” an e-book owns it just as much as the purchaser of a hard copy owns that version of the book. Most of all, make e-books available at the same time as the hard copy comes out. Okay, I just heard the howls going up on that last one, but hear me out. Probably the most famous – or infamous – series of books not released digitally is the Harry Potter series. Think about the number of sales that have been missed because Rowling won’t sell the digital rights to her books. Now think about this: digital versions of the last few books were available BEFORE the books came out. That means, imo, someone from the publishing house leaked the files. Why? Because people felt they were entitled to get the book in digital form. Gee, entitlement again. Okay, this is a long way of saying something very simple — the only ones entitled to being upset over piracy are the authors. But they need to educate themselves to the realities of the situation and put themselves in the place of their readers. There’s a growing number of people who read only digitally. Some because they like the convenience of having hundreds of books with them at all times. Some for ecological reasons — they aren’t killing trees by buying an e-book. Others for medical reasons — they simply can’t hold a book any longer but they can an e-reader. Now, both sides need to talk with one another, learn how their actions impact the other. Somehow, the publishers need to be brought into it as well. I’m just not sure how — until the publishers are willing to adapt to changing times, things are unlikely to change. See, this is what happens when something ticks me off when I’m sick. I get all wound up about things. Any way, what are your thoughts? Is e-book piracy really an issue that should be gone after the way the music industry has gone after music pirates? Or is it an anomaly that will go away if DRM is done away with? Also posted at Mad Genius Club.